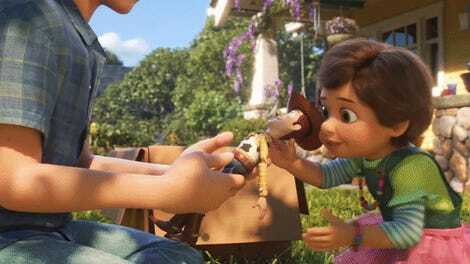 Toy Story 4 begins in the past. Nine years in the past, to be exact. It’s a rainy night and RC has somehow found himself outside in the rain. 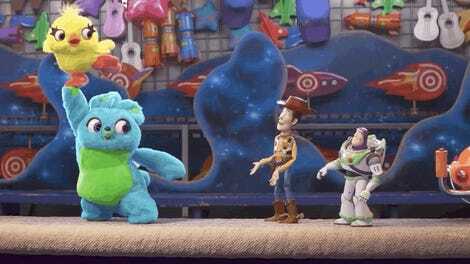 The toys are worried that he’ll be lost forever so Woody goes into Andy’s sister’s room to ask for Bo Peep’s help. Together they put Woody on Slinky Dog, he drops down to the ground, and stretches out—with some help from Bo and a few monkeys—to save RC. On the way up, though, the window to the room closes, trapping Woody outside. It seems that the sister has allowed Bo to be sold and the person there to purchase her has arrived. However, by the time the toys open the window, Woody is gone. He’s under the buyer’s car and grabs Bo when the box she’s in gets put down. Woody tells her he can sneak her out but Bo says no. It’s time to move on. She then offers Woody the opportunity to come too. He thinks about it and, just as he’s about to get in the box and leave, Andy runs out into the rain screaming that he lost Woody. So Woody steps back and watches in shock as Bo gets put into the car and drives away forever. Fade to black and come back up on a closet. All the toys are in the closet and we learn that Bonnie’s mom quickly cleaned her room and shoved everyone into the closet. But this makes the toys nervous because they know at any time they could just be left and forgotten in the closet. Finally, Bonnie finishes breakfast and runs into her room. She throws open the closet and starts yanking out toys. Buzz, Ham, most of them really, and then Woody...but only so she can take the Sheriff badge off of him to put on Jessie. Woody has been left in the closet. As Bonnie is playing with her toys, Woody and a few others watch from inside the closet. Then, Bonnie starts to cry. It turns out today is Kindergarten orientation day but she doesn’t want to go. Bonnie asks if she can bring a toy but her mom says no. Woody is worried about her though so he comes out of the closet and explains that he thinks a toy should go with her to keep an eye out. Everyone disagrees but, then, when they aren’t looking, Woody just sneaks into her backpack. At school, Bonnie is scared, shy and Woody feels terrible as he peeks out from her backpack. The class is supposed to do crafts time but a boy comes to Bonnie’s table and, despite Bonnie trying to make friends, he ignores her and just takes her materials, throwing half of them in the garbage. Woody proceeds to sneak out of the backpack, hide behind a lunch box, run over the garbage, grab a bunch of stuff and put it on Bonnie’s table. She’s curious how all this stuff got there but she doesn’t worry about it and immediately begins making something—a something she nicknames Forky. The teacher, her parents, everyone is excited about Forky, and Bonnie asks if she can bring him on their upcoming road trip. They say yes. Back at home, the toys are furious with Woody that he’d endanger Bonnie and himself by leaving the house like that. But he explains that’s not what’s important. What’s important is that Bonnie made a friend. Literally. And out comes Forky, who keeps saying the word “Trash.” Woody explains he’s a “toy” not “trash” but, when Woody turns away, Forky jumps in the trash. Footage over. 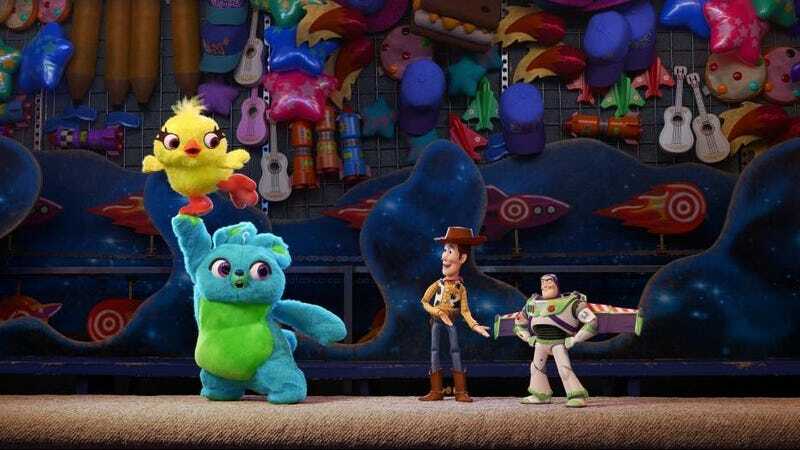 Toy Story 4 is out June 21.